At The Spa at South Bay Plastic Surgeons in Torrance, CoolSculpting is an exciting, FDA-cleared treatment that lets our patients from Manhattan Beach, Redondo Beach, and beyond freeze away unwanted fat they may not be able to shed through diet and exercise alone. Developed by 2 Harvard-based physicians, CoolSculpting uses a revolutionary technology called Cryolipolysis® to freeze and kill stubborn fat cells without surgery, needles, or anesthesia. To visit us for CoolSculpting, request a consultation online, or call South Bay Plastic Surgeons at (310) 784-0644 and one of our helpful staff members will schedule your appointment. Some CoolSculpting patients are concerned that larger areas of stubborn fat will require too many treatments, or that their skin is too loose to benefit from the procedure. Because we want to ensure that CoolSculpting is the ideal treatment option for your needs, we offer free consultations with one of our doctors for patients who are unsure about what’s best-suited for them. In some cases, we may recommend ThermiTight® as a nonsurgical skin tightening procedure. Surgical options, such as liposuction, may also be a more appropriate approach for fat reduction. Some patients can benefit by combining nonsurgical skin tightening with CoolSculpting, which can produce optimal results. Many people, including those who are physically fit, struggle with pockets of localized fat that can cause unsightly bulges and mar an otherwise smooth, toned physique. Using proprietary cryolipolysis technology, which targets only fat cells, CoolSculpting freezes and effectively destroys them without surgery. The amount of fat cells in any adult’s body is typically fixed. When we gain or lose weight, we don’t gain or lose fat cells. Instead, our existing fat cells simply enlarge or shrink. The only certain way to remove fat cells from the body is via a procedure such as CoolSculpting (or surgical liposuction), which applies cold energy outside the skin to target the fat cells beneath. These cells are more vulnerable to cold than other tissues, which remain unharmed. Once fat cells are frozen, they die in a natural process called apoptosis and are safely filtered out of the body by the lymphatic system over the course of a few months. 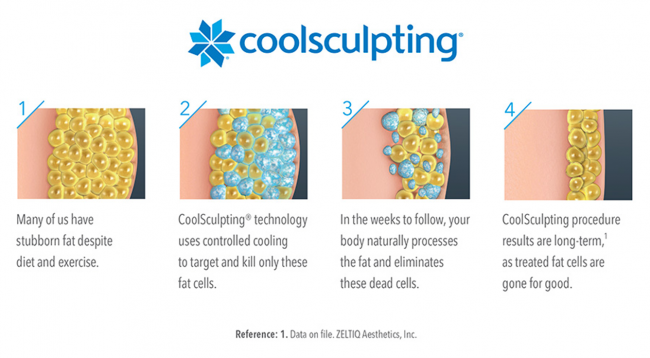 Our practice uses specially designed CoolSculpting applicators to reduce fat in just about any area of the body. Applicators customized for different treatment areas address curved areas, such as love handles or muffin tops, differently than the areas beneath the chin or the upper arms. Whatever applicator we use, the result of the CoolSculpting treatment is still the same—breaking down fat cells through controlled cooling. It’s important to understand that CoolSculpting is not for weight reduction. It’s best for someone who is at or near a healthy weight and wishes to contour specific “trouble spots.” During your consultation, your physician carefully evaluates your areas of concern to determine whether CoolSculpting is the right option for you. You may also discuss the cost of your CoolSculpting procedure, which may vary depending on your selected treatment areas and the amount of fat you’d like to remove. Our CoolSculpting providers–Erica and Frida, along with spa manager Brittany Hall–have all completed extensive CoolSculpting University training. Their experience benefits our patients because they’re able to customize treatments based on a person’s unique needs. We’re also able to offer CoolSculpting more often than many other practices, offering Monday through Saturday appointments during our normal hours plus Wednesday evenings until 8 p.m.
We want our CoolSculpting patients to be comfortable during the procedure, so we’ve created a dedicated “CoolSculpting Getaway” at the med spa. The room includes iPads with your choice of Netflix shows to keep you entertained during the treatment. And for patients whose procedures last 2 or more hours, we’ll order breakfast, lunch, or dinner. Because CoolSculpting is completely non-invasive, the treatment process is simple. You’re invited to make yourself comfortable in a private treatment area. Many patients bring along their laptops, tablets, or books to occupy them while the treatment takes place. A member of our medical team applies a special gel pad to the targeted area of your body to protect your skin and evenly conduct CoolSculpting’s low temperature. He or she then places an applicator with cooling plates over the gel pad. Depending which area you want to target, we use a different hand piece that either will suction a bulge of fat between cooling panels or is simply strapped against your skin. Once the applicator is positioned, it delivers cold energy that penetrates your skin. It may feel intense initially, but the area soon becomes numb, much like using an icepack. In order for CoolSculpting to be effective, fat cells must be exposed to a consistent temperature for a sustained amount of time – typically about 1 hour for the bulging fat of the abdomen or back and longer for areas such as the thighs. Because many people undergo CoolSculpting on multiple areas of their bodies, we can give you a specific timeline during your consultation so that you can plan your day accordingly. Keep in mind that no special preparation is necessary prior to your CoolSculpting appointment, and you won’t have any activity restrictions afterward. Once the procedure is over, your treated areas will be temporarily red and swollen. You may also feel some soreness, but it’s not typically severe enough to prevent you from going about your usual activities. This is a normal reaction and our staff will let you know what to expect after your first treatment. You may return immediately to your regular routine, including working out, running errands, or doing chores. Over the next few days, the redness and swelling will dissipate. Although you may not initially notice any change, your results will gradually develop over the course of the next few months as your body filters away the destroyed cells. You can expect a total fat reduction in the treated area of about 25%. Many people are satisfied with their results after a single treatment, but you may choose an additional treatment. Although your results may last indefinitely, it’s important to maintain a healthy lifestyle after CoolSculpting. Your remaining fat cells can still enlarge in relation to your eating and exercise habits. By keeping up your good habits after treatments, you can enjoy your proportionate, toned physique for years to come.